The 2016 election year is bringing out the worst among some elements of society. From vandalism to physical assaults to large scale race riots to terrorist bombings and mall stabbings, social disorder has become a more prominent feature of life in a polarized America. It’s easy (and politically convenient) for the establishment media to blame Donald Trump for inflaming the political divide. In reality, Trump supporters have far more often been the victims rather than the instigators of political violence. Moreover, the forces driving social unrest have been building for years. And they are being encouraged and funded by far-left organizations. The riotous “Black Lives Matter” movement has received more than $100 million from leftist foundations including billionaire George Soros’s Open Society Institute. Surveys show that large numbers of Americans – including Republicans and Democrats, blacks and whites – agree that race relations have worsened under President Obama’s watch. The nation’s first half-African president has repeatedly sided with racial agitators and refused to denounce antipolice riots. His attorney general, Loretta Lynch, has given legal legitimacy to vicious racial narratives that have little to no basis in fact. In addition to leaving the country with fresh new racial wounds, the outgoing Obama administration will leave America with a doubling of the national debt to nearly $20 trillion, a historically low rate of workforce participation, 20 million more people on food stamps, and a shrinking middle class whose earnings aren’t keeping up with surging costs of things like health insurance. People are frustrated, restless, angry. And officially, we aren’t even in a recession yet. Officially, the inflation rate remains below 2%. What happens when the economy and stock market start tanking? Or when costs for fuel, food, and other consumer goods start taking off again? You won’t want to be caught flat footed when the ugliness hits the fan. 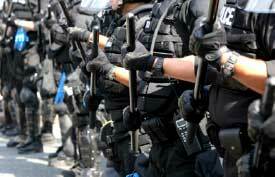 Now is the time to take steps to prepare yourself and your family to weather economic, political, and social unrest. Whether it’s civil disorder or a terrorist attack or a natural disaster that knocks out the power grid, emergency preparedness can mean the difference between life and death. Start with the basics. Make sure you have emergency backup supplies of bottled water and long-lasting foods. At Survival-Goods.com, you can buy easy-to-store boxes each containing a one-month emergency food supply for one adult. If martial law is declared or the streets become too dangerous, you’ll be able to stay well-nourished at home for a protracted period. Make sure you are able defend yourself and your family from threats. Upgraded locks, burglar alarms, and pepper sprays can help reduce your risk of being a victim. At some point, though, you may be confronted with the threat of lethal violence. You must be prepared to defend yourself using lethal force, if necessary. That means owning a firearm, being trained in its usage, and having ample supplies of ammunition on hand at all times. Finally, make sure you are prepared for a financial emergency. The banking system is fragile and vulnerable to any number of threats, including derivatives blow ups and cyber attacks. If banks close and ATMs become inaccessible, you’ll be glad you kept an emergency cash stash. as low as $1.49/oz over spot. But don’t put your full faith in the value of the Federal Reserve Note (or any other fiat currency). It is sure to lose value over time and could one day suffer a massive loss of confidence all at once. If top Treasury and Federal Reserve officials get their way, cash in the form of coins and bills will no longer even circulate in a future cashless economy. Their first priority is to get the $100 bill banned to make it harder for people to hoard and move cash in large value. The ultimate money in the event of a war on cash or in any type of crisis situation remains physical precious metals. If you need to use gold and silver for barter and trade, you’ll want to have a variety of sizes for maximum flexibility. One ounce gold coins are great for storing large amounts of wealth, but they are not necessarily ideal for buying produce at a local farmer’s market. Having gold in quarter ounce, tenth ounce, and even 1 gram denominations gives you more options. Of course, silver is the more practical metal for smaller transactions. One-ounce silver coins/rounds will be widely useful. For smaller transactions and to make change, you’ll also want to have some fractional silver rounds and bars. 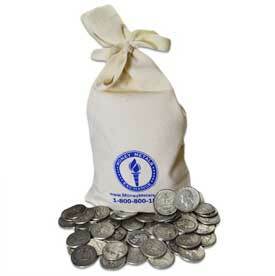 Pre-1965 90% junk silver quarters and dimes are essential for any barter stash. During an economic panic or retail silver shortage, premiums on pre-1965 silver coins could surge. It’s best to stock up on these historic, no-longer-minted coins while premiums are still low, as they are now.